2 What Is Plantar Fasciitis? 3 What Are Common Plantar Fasciitis Causes? 5 What Is Achilles Tendonitis? 7 What Are Common Achilles Tendonitis Symptoms? 8 What Are Achilles Tendonitis Causes? Plantar fasciitis and Achilles tendonitis are two chronic pain conditions of the foot. A chronic pain condition of the foot can be debilitating, as it inhibits the ability to stand, walk, and move about. If foot pain is so severe that a person loses the ability to walk, it can have a major impact on their life. Plantar fasciitis and Achilles tendonitis are often confused, some even calling the condition “plantar tendonitis.” They are two separate conditions, though. Let’s look at the major differences between plantar fasciitis vs. achilles tendonitis. 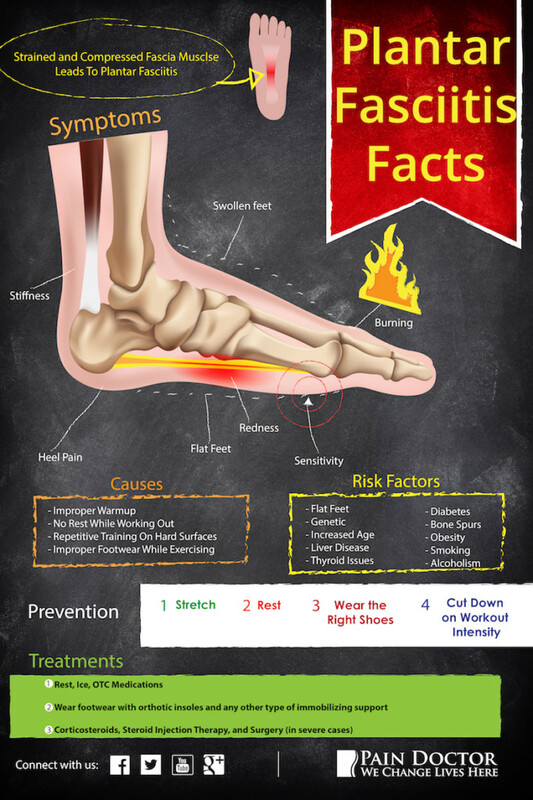 Foot pain can be due to injury or to a number of other factors. For those patients with a history of being on their feet on hard surfaces, plantar fasciitis often can arise. This condition is characterized by heel pain that is at its worst in the morning, may get better by the end of the day, and can be alleviated somewhat with rest. A thick tissue that connects the ball of the foot to the heel is called the fascia. This tissue is responsible for the arch of the foot. When this connective tissue becomes inflamed to the point of pain, it’s called plantar fasciitis. Patients who have plantar fasciitis often limp out of bed first thing in the morning, with sharp pain. When the fascia loosens with use — walking — the pain will subside a bit. The first few steps of the day are often the most painful because the fascia is not stretched or used during sleep. What Are Common Plantar Fasciitis Causes? This foot pain condition is most commonly found in men age 40-70 and is the leading cause of orthopedic care for the feet. While heel spurs — calcium deposits — are commonly found in plantar fasciitis patients, they are not the cause of the pain. They are a reaction by the bone to the fascia’s inflammation. Pain is often made worse in the heel by walking for prolonged periods of time or wearing shoes that do not offer the correct and proper arch support for your foot type. This condition is often seen in those who habitually run, but may also be seen in pregnant women, those with extremely low or high arches, those who stand on their feet for extended periods of time and those who are overweight. The pain may be more severe if climbing stairs or performing intense activity. This pain may come on with time, or may be intense and sudden. It is not uncommon for swelling and redness to also be present. To diagnose plantar fasciitis, a pain doctor will take a series of X-rays of the foot. If a bone spur is present, plantar fasciitis is a likely diagnosis. Additionally, physicians will look for a thickening and inflammation of the fascia from the ball of the foot to the heel. The physician may also look for hairpin fractures in the bones around the foot. These are also common in those experiencing plantar fasciitis pain. Once plantar fasciitis is diagnosed, it is important to seek treatment as soon as possible, as it is possible for both plantar fasciitis and Achilles tendinitis to develop into back, hip or knee problems as you change your gait to compensate for the heel pain. Bone spurs may develop as well and are due to chronic strain on the plantar fascia. Achilles tendonitis is a condition caused by injury to the Achilles tendon. Multiple sources indicate that approximately 11% of all running injuries are later diagnosed as Achilles tendonitis. Achilles tendonitis is brought about by the repetitive motion required of runners and joggers. The biggest complication of Achilles tendon injuries is that they are slow to heal due to the low blood supply to the area. While comparing plantar fasciitis vs. Achilles tendonitis, it’s obvious that runners and joggers do have an increased rate of symptoms. However, the anatomy of the Achilles tendon dictates some differences in diagnosis and treatment. Touted as the strongest tendon in the body, the Achilles tendon connects the calf muscle, beginning around the mid-calf, to the posterior region of the heel bone, or the calcaneus. The Achilles tendon plays a key role in rising up on one’s toes and pushing off the ground when walking or running. Though the phrase tendonitis is commonly used to describe conditions associated with the Achilles tendon, it is a misnomer. 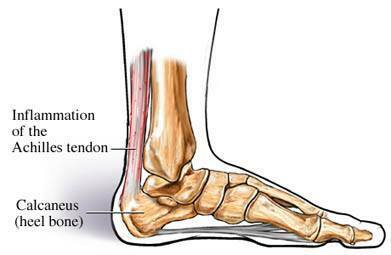 The term refers to inflammation of the tendon, however, this is very rarely the origin of Achilles tendon pain. Most commonly, Achilles tendonitis is characterized by a deterioration of the tendon, along with a disorganization of the tissue. What Are Common Achilles Tendonitis Symptoms? The pain associated with Achilles tendonitis can range from mild to severe, and may have a gradual or a sudden onset. Patients are likely to experience more ankle stiffness in the morning, which is shared in common between plantar fasciitis and Achilles tendonitis. Achilles tendonitis patients however experience increases in pain severity with physical activity, such as walking or running. What Are Achilles Tendonitis Causes? Achilles tendonitis is often described as having a sudden onset; however, evidence suggests a more gradual development of complications, often due to overuse and stress. Overuse is the most common cause of difficulties. It occurs when a proper warm-up routine is not completed before engaging in physical activity or a person starts new activity involving physical exertion after a significant period of time with little to no physical activity. Overload on the tendon leads to a non-inflammatory thickening of the tendon and an increase in tendon stiffness. Over time, if the overuse and overload of the tendon continues, the tendon will begin to become stressed leading to Achilles tendon pain. While overuse is a common cause of Achilles tendonitis, some genetic factors have also been identified as placing an individual more at risk for tendonitis. These factors include increasing age, being a male, and obesity. Individuals with previous difficulties with regard to the Achilles tendon are at risk for tendon rupture, which is a more serious condition requiring immediate medical attention. Finally, ongoing stress and overload to the Achilles tendon eventually leads to degeneration of the tendon, which characterizes tendonitis. Achilles tendonitis may affect anyone, however, individuals with higher activity levels are more at risk. In particular, individuals who frequently engage in activities that involve running and jumping characterize the population most at risk. Just like plantar fasciitis, patients with chronic Achilles tendonitis are at risk for more serious complications. Achilles tendon pain can be avoided with the proper measures. Proper stretching of the tendon before exercise is always recommended, as well as stopping the activity once pain has started. Should you feel minor Achilles tendon pain, it is important to rehabilitate your injury and not continue to push yourself. Repetitive activity on an already painful Achilles tendon may cause the tendon to rupture, requiring further medical intervention. These Achilles tendonitis stretches from the American Academy of Orthopaedic Surgeons are a great resource. Likewise, once plantar fasciitis pain has presented, it is important to rest, ice the area, and choose non-or-low impact exercises until heel pain has disappeared. This video from Pat Stanziano, a sports physiotherapist, shows some gentle plantar fasciitis stretches you can try when you wake up in the morning. To prevent plantar fasciitis and Achilles tendonitis, it is recommended to always be cognizant of your footwear. Achilles tendonitis and plantar fasciitis shoes should always be of a proper fit, and should adhere to your sport and foot type. Additionally, it is advised to avoid walking barefoot or while wearing flimsy shoes such as flip-flops, or high heels. Once you have diagnosed your plantar fasciitis vs. Achilles tendonitis, you can work with your doctor to find relief. This will almost certainly include a change in the shoes you wear to account for the additional arch support. You may need to consider orthotics to prevent further damage and foot pain. The first step in choosing the correct footwear is ensuring you have the proper shoe for your specific activity. Whatever shoes you decide on, you’ll want to make sure they fit properly and won’t cause additional damage or pain for your feet. Determine your activity: Are these casual shoes, dress shoes, or athletic shoes? Consider the specifics of your activities to know what kind of shoes to purchase. If you need dress shoes for work, think about how often you walk. If you’re sitting at a desk you may have some more flexibility than someone who is walking in and out of buildings doing outside sales. Determine the proper arch support: Lack of proper support can cause a number of problems including plantar fasciitis. Proper support is important for maintaining the overall health of your feet. Consider the soles: The bottoms of the shoes can be very important depending on your activity. The wrong soles can cause falls or they may not prevent an injury to the foot. Measure your foot: Your foot size may change and different brands may have different sizes. It is very helpful to have a professional provide a proper measurement for your foot when you’re picking out new shoes to ensure they fit well. Always try them on: You want to make sure the shoes fit properly, so try on both of them and walk around the store. Note the way the arch feels, how the toes fit in the toe box, and if there is any rubbing on any part of the foot. The right shoes are essential to caring for your feet and preventing any further damage from occurring. Aside from making sure you’ve selected the correct shoes for your activity and properly fitting them to your feet, there are a few other ways you can care for your feet in order to prevent Achilles tendonitis and plantar fasciitis. It is most important that your feet are comfortable in your shoes, so avoid shoes that cause extreme discomfort as they will likely cause long-term damage. However, a high heeled shoe may be comfortable but it can still affect the bones in your feet negatively. You may also want to consider the proper socks for your footwear. They can keep your feet dry, help prevent blisters and calluses, and protect your feet. Also, be sure to keep your feet clean to prevent infections, especially for those with diabetic leg pain. Since the causes of plantar fasciitis vs. Achilles tendonitis are different, different treatments are required for each. If prevention and simple stretching haven’t helped, you can consider the following treatments. Always talk to your pain doctor before attempting a new treatment or exercise plan, however, so you don’t make your foot pain condition worse. Achilles tendonitis treatment should start conservatively with physical therapy, non-steroidal anti-inflammatory drugs (NSAIDs) such as ibuprofen and aspirin, application of heat or cold therapy, and rest. In cases of Achilles tendon pain that exhibit symptoms of swelling, you should keep the affected ankle elevated. Application of a cold compress for 15 to 20 minutes is also recommended to reduce pain and swelling. Achilles tendonitis treatment takes time. Those who are regularly involved in sports or exercise routines are strongly encouraged to allow ample time for full recovery. Full recovery may not be achieved for several weeks or even months. Though the patient may no longer be debilitated by symptoms of Achilles tendon pain, stiffness, or weakness, the tendon may still not be fully healed. Always talk to your pain doctor and follow their recommendations for treatment. Chronic or persistent cases of Achilles tendonitis may require the use of a cast, brace, or boot that prevents movement of the foot. This protects the tendon from risk of stress or overuse during the healing process. Patients who are chronically debilitated by Achilles tendon pain may consider for steroid injections. For intraarticular injections, corticosteroids are injected directly into the tendon. Periarticular injections are not made directly into the tendon. Rather, corticosteroids are injected into the area surrounding the affected tendon. Patients are encouraged to discuss this treatment option in depth with their pain doctor, as receiving injections has been found to increase a patient’s risk of future tendon rupture. Surgical intervention is a final option for cases that have not responded to other therapeutic techniques. Surgical intervention is always warranted in cases of tendon rupture. Conservative treatment for plantar fasciitis begins with physical therapy, the use of non-steroidal anti-inflammatory drugs (NSAIDs) such as ibuprofen or aspirin, and, in rare cases, the use of corticosteroid injections. However, while sometimes helpful, it has also been seen that repeat injections of corticosteroids can weaken the area, which may cause further injury to the plantar fascia. Your pain doctor may also recommend a specialized splint for while you are sleeping to correctly and slowly stretch the plantar fascia and facilitate healing. It is rare for plantar fasciitis to be corrected by surgery, and is often only indicated after all conservative measures have failed. Plantar fasciitis and Achilles tendonitis are two foot pain conditions that are often confused–to the extent that many people call it plantar tendonitis. However, plantar fasciitis is a condition characterized by heel pain, whereas Achilles tendonitis occurs in the tendon running up the back of the foot. Because of this, Achilles tendonitis and plantar fasciitis treatments do vary. If you suffer from either of these foot pain conditions, reach out to a pain doctor today to discuss treatment options. They’ll be able to suggest small lifestyle changes, such as better plantar fasciitis shoes or Achilles tendonitis stretches. Or, for more severe cases, they can discuss more interventional treatment options if you suffer from plantar fasciitis or Achilles tendonitis. Wapner KL, Parekh SG. Heel pain. In: DeLee JC, Drez D Jr, Miller MD, eds. DeLee and Drez’s Orthopaedic Sports Medicine.3rd ed. Philadelphia, Pa: Saunders Elsevier; 2009:section F.
Abu-Laban RV, Ho K. Ankle and foot. In: Marx JA, Hockberger RS, Walls RM, et al, eds. Rosen’s Emergency Medicine: Concepts and Clinical Practice. 7th ed. Philadelphia, Pa: Mosby Elsevier; 2009:chap 55. Review Date: 2/19/2011. Reviewed by: Linda J. Vorvick, MD, Medical Director, MEDEX Northwest Division of Physician Assistant Studies, University of Washington, School of Medicine; C. Benjamin Ma, MD, Assistant Professor, Chief, Sports Medicine and Shoulder Service, UCSF Department of Orthopaedic Surgery. Also reviewed by David Zieve, MD, MHA, Medical Director, A.D.A.M., Inc.
Alfredson H, Pietilla T, Ohberg L, Lorentzon R. Achilles tendinosis and calf muscle strength: The effect of short-term immobilization after surgical treatment. Amer J Sports Medicine. 1998;26(2):166-171. Asplund CA, Best TM. Achilles tendon disorders. British Medical J. Mar 2013;346:f1262. Carcia CR, Martin RL, Houck J, Wukich DK. Achilles pain, stiffness, and muscle power deficits: Achilles tendinitis. J Orthop Sports Phys Ther. Sep 2010;40(9):A1-26. Clain MR, Baxter DE. Achilles tendinitis. Foot Ankle. Oct 1992; 13(8):482-7. Khan RJ et al. Surgical interventions for treating acute Achilles tendon ruptures. Cochrane Database of Systematic Rev. 2010;9. Schepsis AA, Jones H, Haas AL. Achilles tendon disorders in athletes. Amer J Sports Medicine. 2002;30(2):287-305. Stretanski MF. Achilles tendinitis. In Essentials of Physical Medicine and Rehabilitation, 2nd Edition. Philadelphia: Saunders Elsevier pp. 407-410.